Toggle bolts are anchors that are used in hollow block, wallboard or plaster. 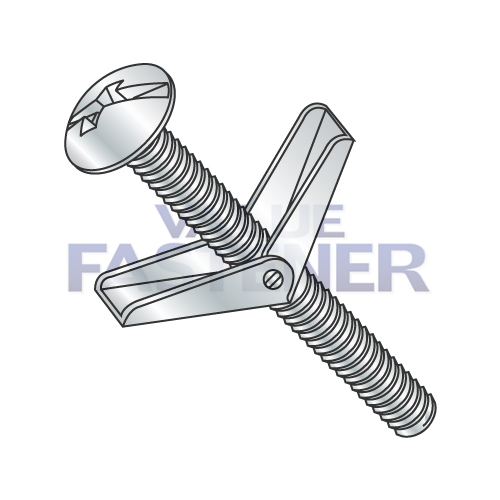 Toggle bolts consist of a machine screw and spring wing toggle that folds back, inserts into a predrilled hole and opens on the other side. Toggle wings are a four-piece fastener consisting of (1) two matching steel "wings" each bent at two 90 degree angles, (2) an internally threaded nut with protrusions space 180 degree's apart which serves as a pivot attaching the two wings, and (3) a wire spring providing the necessare tension to open and close the toggle wings. KapToggle anchors are a 3-piece anchor that cosists of a metal toggle bent at two 90 dgree angles with an internally threaded hole at its center, a serrated nylon strap that extends from both sides of the metal toggle, and a should washer that slides down the strap and fits snug into the predrilled hole on the front side of the assembly. Upon installation of the KapToggle the extra length of the strap snaps off. Plastic toggles are light-dute anchors used in wallboard, panels or solid masonry. Plastic toggles are installed with a screw.